Do You Serve Alcohol? Are Drinks Expensive? Yes, we now serve Domestic and Imported beers, Top-Brand Liquors and Champagnes as well as wine. Our prices are very competitive compared with other clubs. Compared to a local “Beer and Shot Joint” our prices are higher, but for a High-end adult cabaret with a national reputation for Excellence our prices are very reasonable. Most Drink Prices range from $5 to $10. We have several signature cocktails NOT FOUND anywhere else and all our cocktails are made with Fresh, High-quality ingredients and Top Brand Liquors. Yummy!! Every week we have a "Limited Edition" Cocktail that have been featured on the TV show Bar Rescue. Many of them can be sampled in a “Micro-shot” for only 5 cents! Do You Have Tables With Bottle Service? Yes! 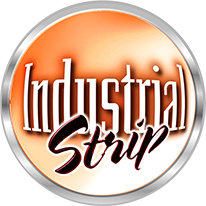 Industrial Strip has several Exclusive Areas with private access to our stages dedicated for bottle service guests. On most nights there is a Bottle Service Special for only $99!